"I love you" translated into 50 languages and the locations in which you'd hear them spoken. 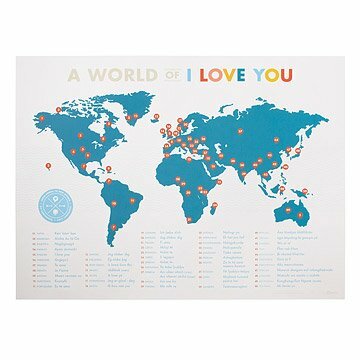 They say that love is the universal language, and this unique map by Tim & Aurelia Sanders celebrates the one declaration we all share across the world- I love you. The poster displays the phrase translated into 50 languages and pinpoints the locations in which you'd hear the sweet statement spoken. Perfect for a lover of language or that special someone who speaks to your heart. Designed in Madison, Wisconsin. Printed in Minneapolis, Minnesota. Tim and Aurelia Sanders think people should enjoy more mirth. They mixed together data visualization, writing, and humor to create artwork that was smart as well as funny. Their process begins with a mix of ideas and sketches, which are gradually refined through research, experimentation, and "occasional hair pulling." Timothy employs his background as an art director and playwright, and Aurelia keeps their projects well edited and on track. "It's a great pleasure to see a passerby stop at one of our posters, lean in close, and start to laugh," they say. Have a peek at Tim's sketchbooks to see how his thought process works as he creates new posters. Arrives rolled in protective tube. Fun addition to my English classroom! I purchased this and had it dry mounted for my English classroom. I'm challenging my students to learn at least three new ways to say "I love you." It's a fun way to combine language and geography! The poster is beautiful, made out of high quality paper. My significant other adored this gift. My husband and I decided to do the whole paper for first anniversary, etc. for our wedding anniversaries and this is what he got me. It is absolutely perfect as I say "I love you" in Spanish often- now I can say it in multiple languages! Great gift! My niece loved this unique gift! I had this poster framed and gave it to my niece for graduation. She loved it! I would buy this again for someone else! This past holiday season, my wife and I agreed not so give gifts to each other. We have a 14 month old and were getting a bathroom remodeled. I however went ahead and gave her this beautiful map of love as a little surprise! She loved it, got it framed and it is now hanging proudly in our loving home. This item surpassed my expectations!